This was a tavern site along the Marsh Creek Road as early as 1763. 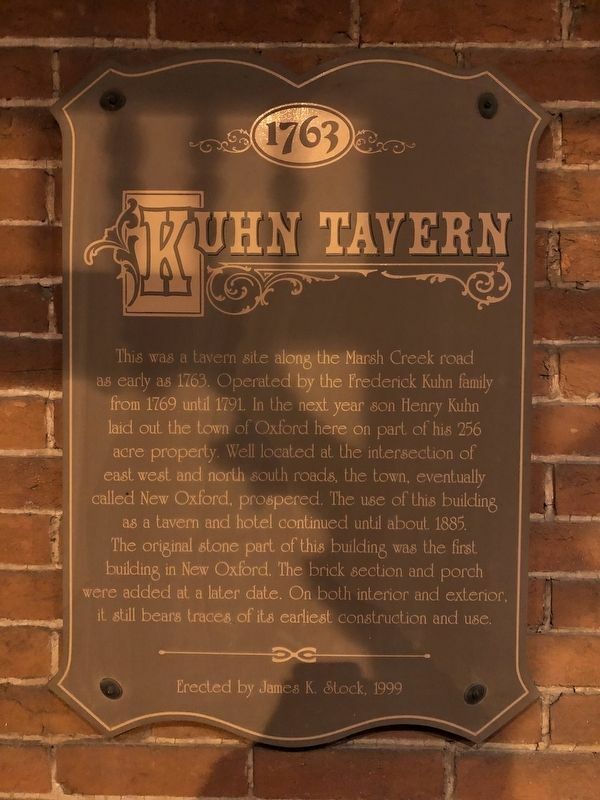 Operated by the Frederick Kuhn family from 1769 until 1791. In the next year son Henry Kuhn laid out, the town of Oxford here on part of his 256 acre property. Well located at the intersection of east west, and north south roads, the town, eventually called New Oxford, prospered. 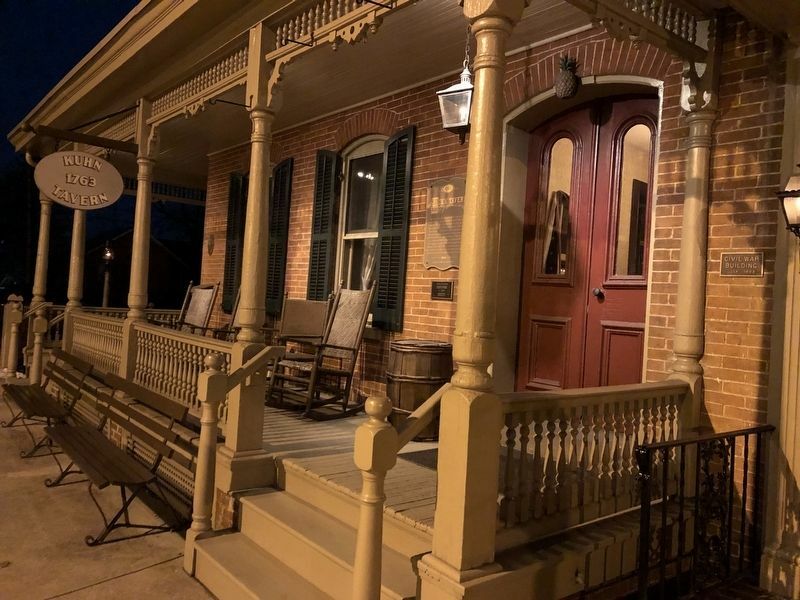 The use of this building as a tavern and hotel continued until about 1885. The original part of this building was the first building in New Oxford. The brick section and porch were added at a later date. On both interior and exterior it still bears traces of its earliest construction and use. Erected 1999 by James K. Stock. Location. 39° 51.85′ N, 77° 3.388′ W. Marker is in New Oxford, Pennsylvania, in Adams County. Marker is on Center Square north of Lincoln Way West (U.S. 30), on the right when traveling west. Touch for map. Marker is at or near this postal address: 11 Center Square, New Oxford PA 17350, United States of America. Touch for directions. (within shouting distance of this marker); Building the Highway (within shouting distance of this marker); New Oxford Veterans Memorial (within shouting distance of this marker); Road Versus Rail (approx. 0.2 miles away); Gettysburg Campaign (approx. 0.2 miles away); Fill 'Er Up (approx. 0.4 miles away); Conewago Chapel (approx. 0.7 miles away). Touch for a list and map of all markers in New Oxford. More. 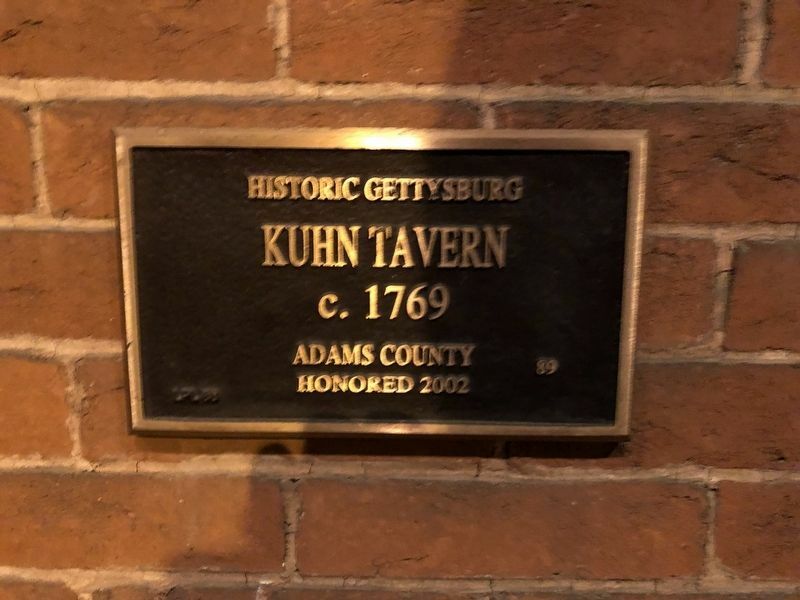 Search the internet for Kuhn Tavern. Credits. This page was last revised on February 26, 2019. This page originally submitted on February 24, 2019, by Devry Becker Jones of Washington, District of Columbia. This page has been viewed 41 times since then. Photos: 1, 2, 3. submitted on February 24, 2019, by Devry Becker Jones of Washington, District of Columbia. • Bill Pfingsten was the editor who published this page.